NEW!! Now accepting direct orders by credit card through PayPal!! NEW!!! Listen to "Waves of Sorrow," the song in "WindWords of Wyoming," by clicking on the above link!!! 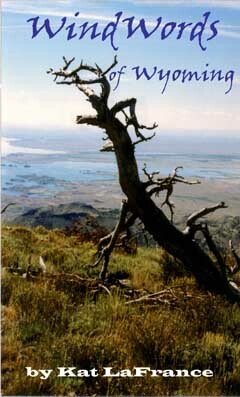 Casper JOURNAL: "Former Casper Resident Publishes Wyoming Essays"
WHAT DO OTHERS THINK OF MY BOOK? ...your words sing, and the song is one reflecting a great inner stillness and peace...it makes us listeners slow down- stop, and take time for the beauty in small things around us, to appreciate the usual and the ordinary- miracles nonetheless. What a wondrous gem you have made!! On some levels it reminds me of Anne Morrow Lindberg's books, and/or Rosalie Sorrels' mother's recollections. In "WindWords of Wyoming"... the land lives in your hands---and you make its colors as vivid as any reality-based laser photo. In a grand way, you and Lewis and Clark's journals are praising and describing the same special land mass--the American West. They found it when it was pristine---and you, by looking at the beauty spots and away from the crap, like any good photographer had to teach themselves to do, have beamed your light on the beauty that still remains. -Art Thieme- recipient of the Folk Alliance first Legacy Life Membership. Also, his photographic documentation of folk and bluegrass musicians is to be housed in the Smithsonian. "WindWords of Wyoming" is absolutely wonderful and I'm enjoying every word...You have a tremendous command of words; I feel as if I'm right there with you. - Mrs. MJM - a born and raised, longtime Wyomingite. "WindWords of Wyoming," by Kat LaFrance, is one of the most genuinely wonderful collections that I have ever had the pleasure to read. Kat writes so wistfully and poignantly about her life and her Wyoming home, that you can feel the majesty of places like Shirley Mountain seen through her eyes. Both her poetry and prose shine in this collection, and in multiple readings, I continue to rediscover old favorites, and even see other pieces in a new light. Everyday life is re-invented in this collection in a most joyous way; how to let go, how to make peace with both life and death, how much fun it can be just to let Nature be a part of your life, and even the simple joys of things like "ShutEyes Cleaning". This is the kind of book that was written to be dog-eared, have its passages highlighted, and to be an old friend who falls open to your favorite page every time. I was most delighted, my daughter gave me your book 'WindWords of Wyoming'. You certainly have a way with words. I'm enjoying it very much. All material on this website is copyrighted by the author. All rights reserved.